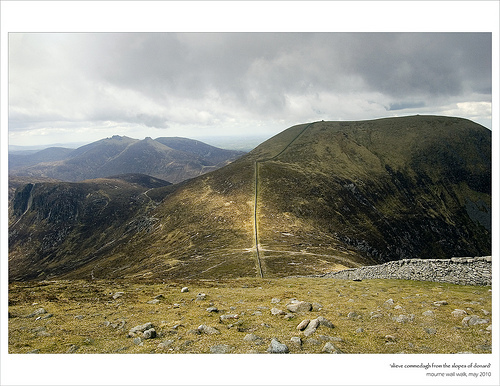 Sorry but Commedagh can't come out to play..
Having viewed some of the photos on here, Commedagh was one mountain that I was really looking forward to and would represent the 2nd last major climb as I made my way around the Mourne Wall. Typical then that after a relatively clear day, a massive thick cloud should move in across the summit just as I approached. Because of this, my experience of Commedagh was limited to a quick stop at the hefty watchtower and a brief but heavy shower of hailstones. I briefly contemplated walking over to the summit proper but that would have involved literally walking into the storm-cloud and with both my mind and body in a poor condition after a days walking, I decided that probably wasn't the best idea and quickly moved off to Donard.